"ONE CREEPY BONE-CHILLING THRILLER THAT WILL LEAVE YOU ON THE EDGE OF YOUR SEAT!" Emily is anxious to visit her aunt and uncle at their cozy cottage, located in the lush English countryside. During her visit, Emily is invited to sleep in the attic. Within a few minutes after her aunt brought her to her room, Emily felt a strange presence behind her, wondering if the experience was simply due to an overtired mind on an exhausting day of travel. As she tried to brush off the events that took place the night before, new events began to torment Emily the next day. What did she see in the mirror, was the doll still sitting on the rocking chair, and why did Wooky hiss and scratch Emily? Who turned the Eliss Family portrait upside down, and what was Emily's first impression of John McArthur? What did Emily feel when she shook hands with Jonathan, and did Emily's curiosity about the woodlot upset her aunt? What was chasing Emily and her aunt through the woods that made Emily extremely apprehensive? Who put the doll in Emily's bed? As Emily found herself terrified and trembling, did the mystery that she found have something to do with her? Was Emily hallucinating, or did a ghost hiss at her as a putrid smell filled the room? Did anyone believe Emily, or did they all think that Emily was having nightmares? I highly recommend this spine-tingling novel to all thriller and mystery lovers, who enjoy intense suspense, with a blend of romance and humor. Pauline Holyoak becomes a Master storyteller as she fills each page with love, magic, and horror. The reader is invited to take an unforgettable roller-coaster ride as you witness the same terror as if viewing Hitchcock in his classic tradition. Does Emily become a target by mysterious spirits, while she's determined to unlock hidden secrets? The author paints each page with fantasy, colorful characters, and haunting events that would light up a movie screen. When Emily returns years later to find out the answers, who will be seeking revenge, and does Jonathan guide her in a dangerous mission? "MERRYWEATHER LODGE: Ancient Revenge" is as scary as THE GLASS HOUSE, as mesmerizing as EYE OF THE BEHOLDER, and as gripping as DON'T SAY A WORD, with Michael Douglas. Thank you very much Geri. That was a lovely review. You are quite welcome Pauline. The book was a fascinating, addictive read. One that I shall add to my personal library shelf & read again. Excellent work, creative & your Talent Glows within the pages! Geri, a great review for "Merryweather Lodge." I'll add it to my TBR stack which is growing by leaps and bounds. 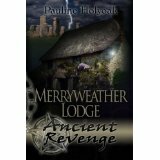 Merryweather Lodge sounds fascinating. I purchased it a while back but haven't had the chance to sit down and enjoy it. I am looking forward to a day with Pauline Holyoak out in my backyard, sipping on tea and reading her novel. Thank you Betty & Thank you for visiting & commenting. A Great Read indeed! Talent glows page-after-page.Thank you kindly for visiting & commenting.